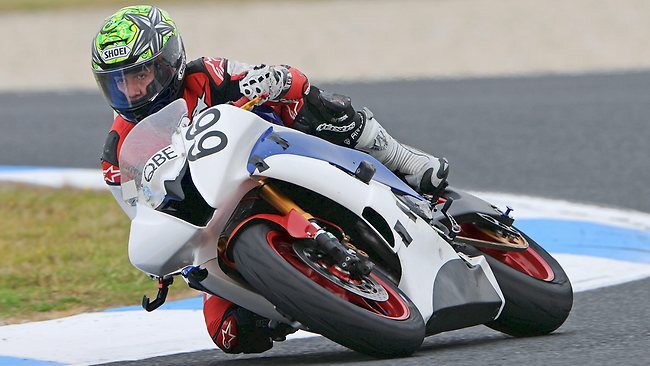 A TEENAGE motorcycle racer from Queensland was killed in a crash during a support race at the Superbike World Championship meet at Phillip Island yesterday. Oscar McIntyre, 17, was competing in the opening round of the Superstock 600cc Championship. The crash, which also involved two other riders, occurred on lap two of the scheduled 12-lap race. Organisers said the other riders involved were Luke Burgess and Michael Lockhart. Burgess was treated at the circuit's medical centre and released while Lockhart remains under observation with non life-threatening injuries. Officials called off the rest of the day's program, including the Superpole duel for the top ten qualifiers for today's two superbike races. Kawasaki's English rider Tom Sykes will start from pole, based on the quickest time recorded in the regular qualifying session earlier yesterday. Second fastest was the Aprilia of 2010 world champion Max Biaggi followed by the Ducatis of reigning No.1 Carlos Checa and Czech rider Jakub Smrz. Queenslander Oscar McIntyre has been killed in a tragic accident during the Australian Superstock 600 support race at Phillip Island. Bryan Staring headed the Australian qualifiers, the 18th-fastest time putting his Kawasaki on the fifth row of the grid in Sunday's two races. Fellow Aussies Josh Brookes (Suzuki) and Mark Aitchison (BMW) are on row six and David Johnson (BMW) row seven. Biaggi was the fastest down the main chute in qualifying, winding his V4 Aprilia out to 323.7km/h. Newcastle's Broc Parkes was fastest qualifier for the Supersport championship opener from fellow Honda riders Sam Lowes of Britain and Jules Cluzel of France. Kawasaki's two-time world champion Kenan Sofuoglu of Turkey was fourth fastest. Australia's second rider, Jed Metcher, was 17th fastest on his Yamaha.